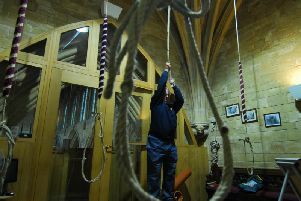 St Andrew’s Church’s Open Day in Leasingham proved to be very popular, with around 200 visitors keen to climb the tower to see the four bells, as well as taking photos of the village views. People were also interested in old parish records of births, marriages and deaths dating back to the 1500’s. There was information on Leasingham men who fought in the First World War and a census from 1911. Displays of poppies marked the Armistice centenary, there was ancient communion silverware and Bishop Edward Trollope’s old robes. A Christmas Craft and Gift Fayre was held at the same time in the village hall for the Air Ambulance.